Essentially, my technique is to analyze my immediate context, reflect on my state of mind in light of how quickly I need to arrive at the place I’m going, and adjust my practice accordingly—to push just enough so that I can move faster than is comfortable without wrecking the car and endangering my life. While I’m not recommending that someone adopt my driving habits, I do ask you to consider how the metaphor is perhaps relevant to the work we’re doing together in this workshop. As we confront privilege, critique inequitable systems, and work to change them, how fast can we expect to move? How imperative is it that we, our students, our colleagues, our parent population, etc., get the bleep out of the fast lane in order to arrive somewhere more quickly than we might otherwise? How urgent is this work in our world? And who gets the privilege to decide? Describe your place. Consider the obstacles you’ll encounter and the allies who will support your journey. Consider how you can push beyond both to teach from a position of social justice, that is to: acknowledge privilege, recognize oppression, and critique and work to change social and educational systems that inhibit equity and access to opportunity that would allow our students to thrive in their lives and in the world. 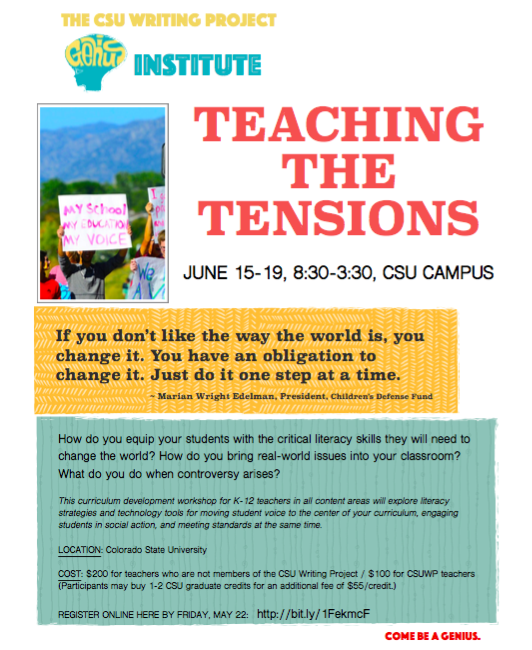 Over the next few days, you’ll meet our small group of CSUWP fellows–Collin Shields, Tara Rigby, Elliott Johnston, Jenny St. Romain, and me–as we tackle questions related to tackling issues of privilege, power, difference, controversy, and so forth in our classrooms and the profession. At the end of each day, one of us will invite the rest of the group to post some fruits of our collective thought labor. We want one thing to be clear up front: we don’t know the answers. There are no definitive answers. But we’re up for struggling together through questions we think ought to matter to all of us since we believe that part of our mission as educators is to work toward a more socially just and peaceful world. What’s an important question that has stuck with you today? (It can be from the list below, but it doesn’t have to be.) How is this question stretching your thinking? What do you think you know at this point? What do you want to keep thinking about? What battles are worth fighting? When do I need to make a statement? When do I need to say something (a bigoted view, for instance) is wrong? How do we honor student voices? How do we help students talk about things they are uncomfortable with? How do we help students have conversations where they open up to someone they disagree with? Sometimes they may leave discussions only becoming more hardened in their views. What are kids more comfortable talking about? What do you do when you carefully set the class up to deal with social justice issues in class and things fall apart? How do you work through these issues with different groups? How do we help students (and really our society) work through difficult issues and consider the logic of perspectives they don’t agree with? How do we confront issues of race/class/gender/etc. in our classroom settings and professional conversations so that people can hear what everyone is saying? How do we push back? How do we deal with pushback from students, colleagues, and parents? What if we teach in a homogeneous setting? What if we don’t, but as white and privileged teachers aren’t sure what to say without exposing our ignorance or making things worse? How do we present/introduce minority perspectives without essentializing an entire group? How do we invite minority students to share an alternative point of view without making them feel as if they have to act as spokespersons for an entire group of people? Who gets to talk about race? Who gets to decide that ______ is an non-issue? When/how can we get into nuanced questions about race, etc., esp. within the time frame of a constrained curriculum? When do you skim the surface, and when do you dive deep (Is that a rabbit hole?)? If I don’t do the latter, am I perpetuating/reinforcing the system of privilege? When do traditional models get disrupted for students? How do we stay hopeful? How do we disrupt our own assumptions? Which axes should we be grinding? How do you deal with complex issues in age-appropriate ways? How do you recognize the inequities of students’ circumstances without making them feel powerless or victimized? Who has the privilege not to think that “something is a big deal”? What privileges do you possess that are invisible to you?